Plex is an all-in-one media sharing platform that not just organizes all your media files with great ease but also provides an easy access to them from any of your devices. It enables the sharing of media on a multitude of devices by creating a main store on your home computer that would act as a server from where the media is delivered or relayed on the other devices at home or nearby through beautiful and slick interfaces. It is available in multiple variants; one is the standard Plex Media server, the Home Theatre version and third is Plex Media server for NAS. You have to download the media server and install it on the home computer which relays it to all other connected devices, but remember all the devices that intend to share this pie need to install a separate app which is available at their respective app stores completely free of cost. Plex is a free platform and provides all the sharing and sorting options without any financial stipulations but if you crave for some extra enhancements and features, then you can opt for an up gradation to Plex Premium Pass subscription that costs almost $5 per month. Plex organizes your media files in a beautiful and accessible manner by providing attractive and informative covers to let them an enhanced and rich look. 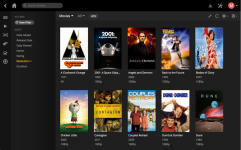 Plex user interface is slick, attractive and user friendly. All the media files are very well classified into various genres, provided with beautiful cover arts, and loaded with all the information a user needs. Like any efficient media player, it also offers features like playlists, video library, watch later and various recommendations that draw data from your own library or from any of the channels that you have installed. Additional features like Metadata and playlists from Vevo (without any ads) further enhance the Plex experience. Plex is compatible with almost all devices running Android, iOS, Windows Phone or windows8 as well as most smart TVs with a lot of set-top boxes that include any Android TV platform, the new Apple TV, Chromecast , Amazon Fire TV , Roku, Ouya , or gaming zones like Xbox One, Xbox 360, Playstation 4 and Playstation 3. Its smooth functioning strongly depends upon the network speed, ideally above 8 mbps, to get a zero hindrance, glitch-free experience that you deserve with this awesome suite. What do you think about Plex?